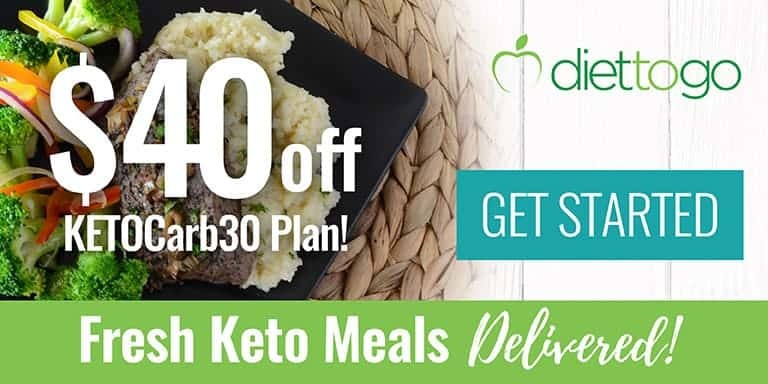 Enjoy your favorite pasta dishes on a keto diet. 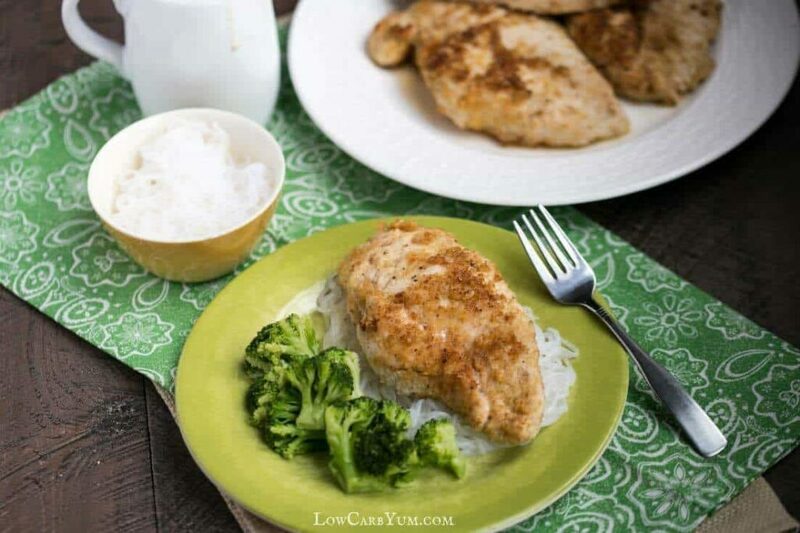 You’ll love this gluten free low carb chicken piccata with angel hair pasta with only 5g carbs. I had a big stash of Miracle Noodles that I bought a while ago that were close to the “Best Used by” date. I found them in the pantry closet somewhat hidden. There was also a four pack of boneless skinless chicken breasts in thawed in the refrigerator that I needed to use up. So, I looked online for a good recipe to use both. 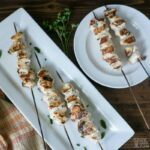 I found some great looking recipes for Chicken Piccata with Angel Hair. Unfortunately, most of the recipes called for capers and I didn’t have any. Luckily, I stumbled upon a chicken piccata recipe over at The Pioneer Woman that doesn’t call for capers. 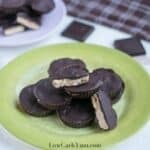 So, I used that recipe as a guide for a low carb version. When making this chicken piccata with angel hair pasta recipe, you’ll want to be sure to have your chicken pounded or cut very thin. Otherwise, it won’t cook well in the pan. The “breading” for the chicken is a mainly crushed pork rinds. 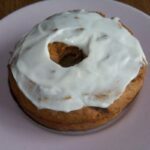 But, I also added in a little bit of coconut flour to give it more of a real flour taste and texture. I keep crushed pork rinds in a container in my freezer. It makes it very convenient for when I want them for a recipe. They should keep for at least 6 months. I had a little issue with my meat mallet. The handle came off as I was using it. So, I didn’t get my chicken breasts as flat as they should be. My husband tried to help me out. But, he’s so strong, he was pulverizing the chicken as he smacked down on it. I would have had to make a meatloaf if I let him continue. I’ve got a new meat pounder on order so I won’t have to worry the next time I need to pound down some meat. Pounding meat is something I don’t do that often. But this Chicken Piccata with Angel Hair Pasta was so good, I want to make it again. I particularly liked the tangy cream sauce. 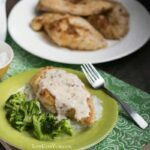 The sauce I made is a bit different than the original from The Pioneer Woman. I used all chicken broth and no wine to lower carbs. The taste of the sauce was amazing. You can make adjustments to the seasonings if it’s too tart. However, it was perfect for me and I didn’t need to change anything. Lately, I’ve been in somewhat of a chicken mood. 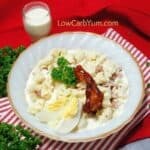 I’ve been using the yummy low carb sauces I got from LC Foods. And, now that it’s spring, we’ve had a few good days for grilling the meat outdoors. My whole family has been eating chicken with me. 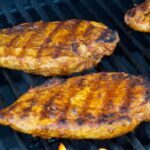 The great thing is that when it comes to chicken and steak, my husband is always ready to eat it. Meat is his favorite low carb food. I’ve only had chicken piccata with angel hair pasta at a restaurant. And, it was many years ago before I moved to low carb. This is my first attempt at cooking it myself. I’m not sure why it took me so long to make this delicious chicken dish. Next time, I’ll make it in more of a traditional way using the capers. 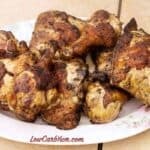 I just posted a collection of low carb chicken recipes on Community Table. It’s such a great every day meat. I doubt I could every get tired of eating it. 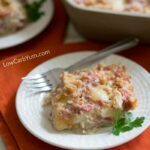 Casseroles are another one of my favorite ways to make chicken. 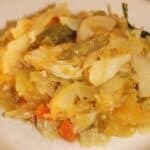 I also have a collection of chicken casserole recipes that I put together. If you don’t have any Miracle Noodle angel hair pasta, you could just spiralize some low carb vegetables. Or, you can just serve the chicken over some spaghetti squash strands. 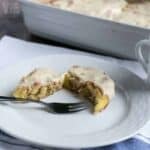 If you give this recipe a try, I’d love to know what you thought of it. Next time, I may just pound the meat thin, coat it, and fry it in the butter and oil. It was delicious just like that without the added sauce. 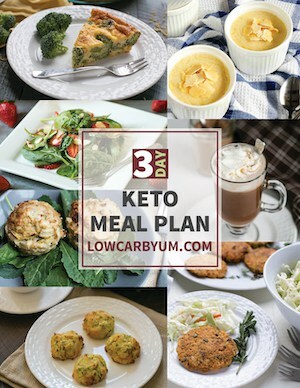 Enjoy your favorite pasta dishes on a keto diet. 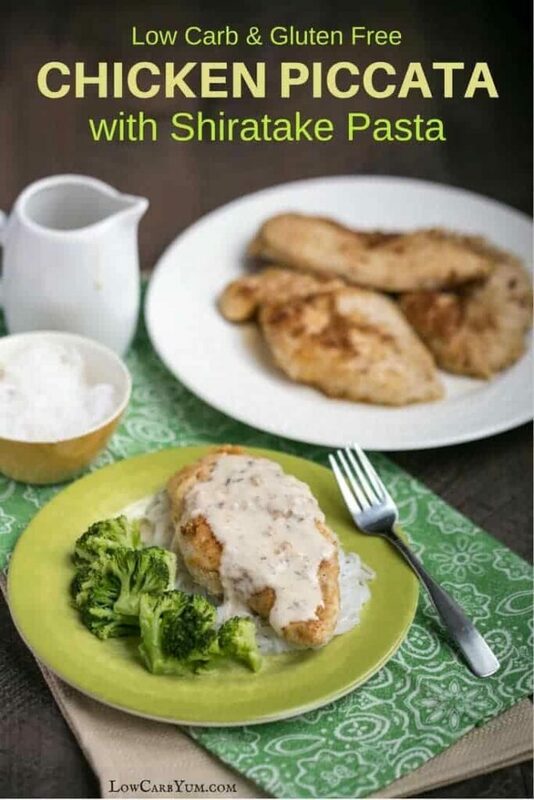 You'll love this gluten free low carb chicken piccata with shiratake pasta with only 5g carbs. Prepare Miracle Noodles by draining, rinsing, and boiling per package directions. I like to then heat the noodles in a dry pan until most of the water has been removed (they will start to stick to pan bottom). Using a meat mallet, pound chicken to about half inch thickness. Or, you can use only two breasts and butterfly them in half. 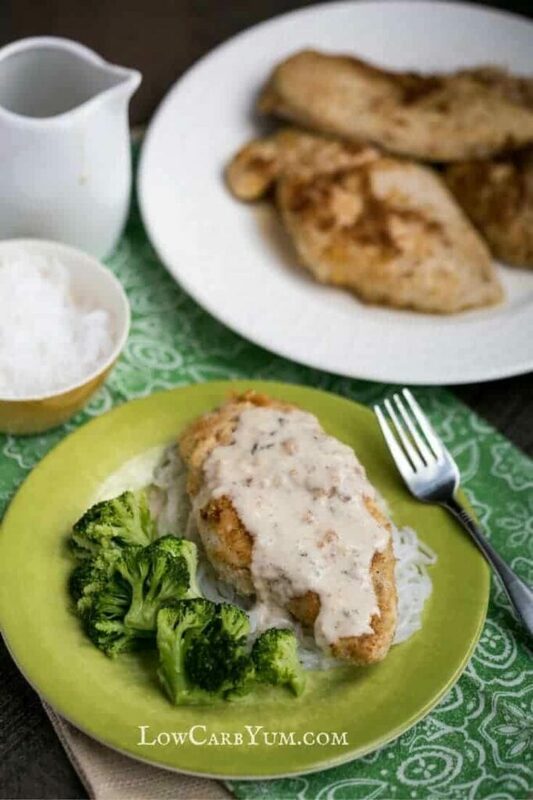 Combine pork rinds, coconut flour, onion powder, salt, and pepper in dish suitable for coating chicken. 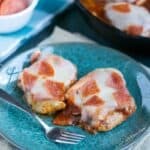 Lightly coat each chicken breast with mixture. Heat 2 tablespoons butter with 2 tablespoons olive oil over medium high heat. 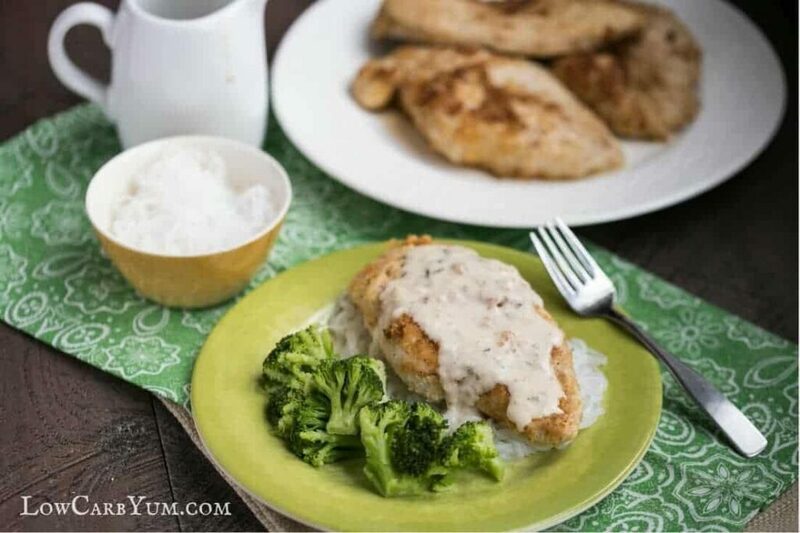 Cook 2 coated chicken breasts in the hot fat until each side is browned. 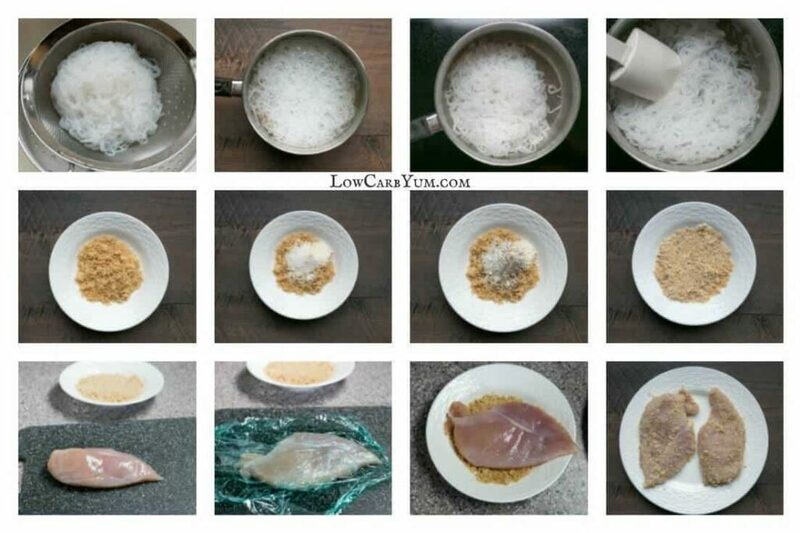 Remove cooked chicken to plate. Add the additional 2 tablespoons each of butter and olive oil. Cook remaining two coated chicken breasts in hot fat until golden on both sides. Remove cooked breasts to plate. Reduce heat to medium. Add chicken broth and lemon juice. Sprinkle in xanthan gum and combine into broth mixture with a whisk. Heat until sauce is thickened. Whisk in heavy cream. Taste and adjust seasonings if need. Sprinkle in parsley. Remove from heat. Place each chicken on a bed of Miracle Noodles angel hair shiratake pasta. 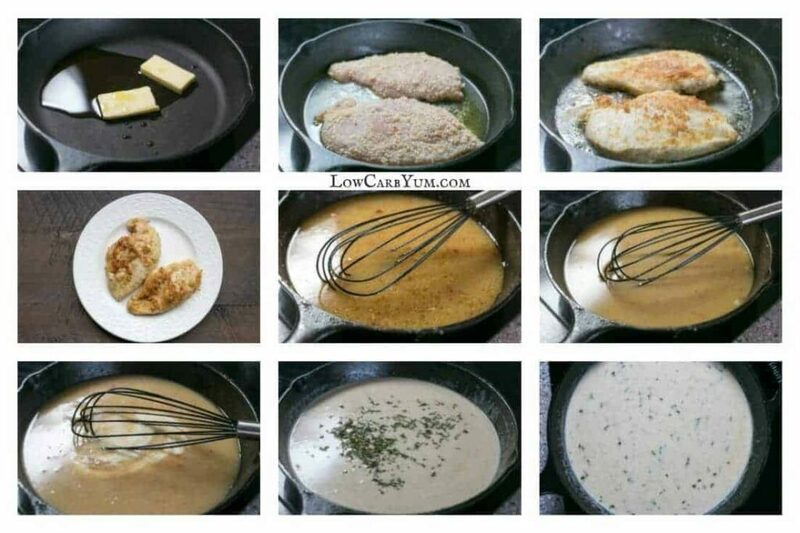 Cover each breast with cream sauce. For those watching calories, be light on the sauce. A little goes a long way.